Centrally located in North America, Americlock is the world’s premier clock manufacturer of large custom monumental clocks, carillons, wind-vanes, and globes. We’re also specialists in historic clock restoration, custom special projects, and consulting/advising work on existing as well as future installations. With world-wide installation, repair, and consulting services, we have clock projects on every continent (still working on Antarctica of course). Our custom clock designs are either traditional or modern depending on the building and the location of the clocks. Clock projects are often combined with our cast bell digital systems which reproduce the sounds of real cast iron/bronze bells where real cast bells cannot be installed. 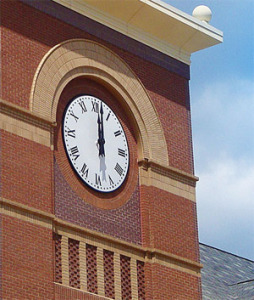 As the leading jumbo clock manufacturer, our monumental clocks are fabricated using high-end materials including fiberglass, acrylic, copper, brass, bronze, stainless steel, titanium, iron, steel, and a variety of other weather-resistant materials (each project is evaluated to ensure the right selection of composites to prolong the clock’s lifespan). Custom-made and designed to conform to the needs of the architecture that they are installed around, clocks come in a variety of styles (such as skeleton dials, modern, traditional) and formats (including floral clocks for gardens and outdoor areas, bracket clocks that project from the corners or parts of buildings, and tower clocks for churches, free-standing towers or highrises that feature very large wall clocks. As the best clock tower company in the world, from design to materials to delivery and installation we work with you to develop the right set of services that will produce the best results for your project. While Americlock offers a suite of predesigned traditional options to select from when it comes to designing clocks, globes, and weathervanes, we work with our clients to design and develop custom projects. We understand that many projects are subject to time constraints and we help our clients to understand how quickly projects can be fabricated in addition to offering accelerated installation schedules. Many of the projects Americlock fabricates use a carefully selected combination of materials to produce the most effective results. For clients with specific requirements, we work to ensure that custom projects are crafted according to exacting standards. All of our clocks, digital bell systems, and custom projects come with installation options for either full-service installation or advising, anywhere in the United States and on select sites around the world.